BEVERLY HILLS, CA – Times, tastes and celebrities may change, but the grandiose Beverly Hilton has continuously embodied chic California cool since it opened in 1955. From Marilyn to Madonna and on to Miley and Pink, the rich, famous and beautiful have congregated at this swank spot, earning it the moniker “the place to see and be seen.” Much of this “seeing” takes place at the hotel’s AquaStar Pool, where A-Listers fresh from the Golden Globe Awards, Oscar Nominees Luncheon or one of the 100 or so other red carpet events held here annually frequently gather to mingle. 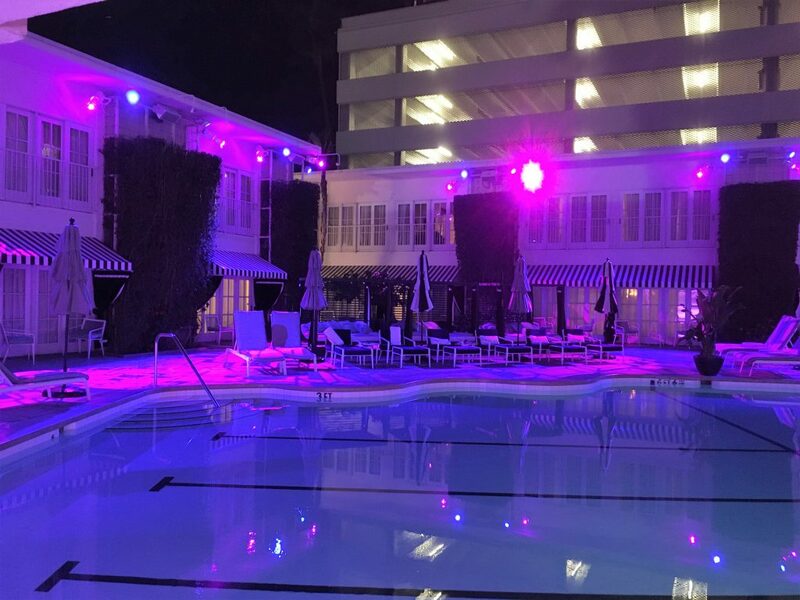 Now the famous pool deck has become even more dazzling, thanks to a collection of CHAUVET Professional and ILUMINARC fixtures installed by AMP’D Entertainment. The new lighting system is intended to give the iconic pool deck an updated, vibrant look. Given the variety of top drawer functions that take place at the pool, flexibility (along with a generous serving of color) were the key factors in selecting the fixtures used. Kharrat and his team achieved this goal by drawing on the versatility and color rendering capabilities of the Ovation E-910FC color mixing ERS-style fixture and Colorist Pod 7Qa RGBA fixture. A collection of 22 Ovation E-910FC units and 24 Colorist fixtures were installed around the pool deck under an overhang for protection from the elements, but above eight existing 17’ tall hedge walls. In addition to the fixtures installed around the pool deck, 16 Colorist Pod 7Qa RGBA units were mounted in a large tropical planter that is used to provide privacy for the poolside restaurant. Another nine Colorist fixtures were mounted near the tops of three very tall palm trees to lend added pop to the pool design. 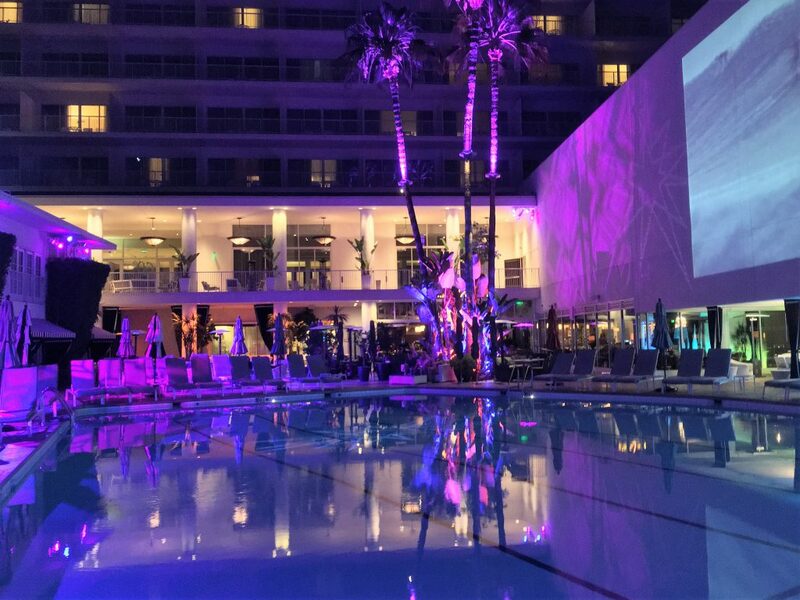 Seamlessly designed, the new Beverly Hilton pool lighting system seems to blend naturally with its stylish surroundings. However, as is invariably the case with such smooth free-flowing designs, this project was not without its trying moments. In the end, this effort paid off with a poolside lighting system that is not only stunningly beautiful, but will also save the hotel money. It is estimated that the Beverly Hilton will be saving approximately $7,500 in lamp changes and maintenance annually by switching from incandescent to LED fixtures. Then there is also the affordable price of the Chauvet and ILUMINARC fixtures themselves, as well as priceless ability to now have the flexibility of transforming the spaces color scheme at a moment's notice.